AT THIS point, even death makes more sense to Janice Brown than the actions of the Department of Human Services and Philadelphia Family Court. Brown knows that death doesn’t have to give a reason for taking her loved ones, but she always thought DHS and the courts would. So she’s had a harder time accepting the loss of the children who were taken from her by the system than the loss of the children taken by death. “Death you can’t do anything about. But the loved ones you know are still here and living, but can’t see – I think of them every day and night,” said Brown, whose 22-year-old daughter, Latoya Smith, and 11-month-old granddaughter, Rimanee were killed in June 2009 along with two other young children when a driver fleeing police slammed into the Feltonville sidewalk where they were sitting. Six months after the tragedy, DHS removed Brown’s three grandchildren, including the surviving son of her dead daughter, and placed them in foster care, citing relatively minor neglect reports that had been filed against her more than a decade before when she was raising her own children. A judge returned one of the grandkids to Brown but the other two were adopted and Brown isn’t allowed to visit them. Then, in December, DHS asked Brown to take in three new children. If Brown was allowed to keep one grandchild, why were the other two taken away? And if she was unfit, why would DHS ask to place more kids in her care? “It was like God said, ‘Here, I’m going to let DHS put three more children in your care to show them that you did nothing wrong,’ ” said Brown, whose struggles were detailed by the Daily News in March 2010, before the final fate of the children was decided. For the last four years, Brown – who was not allowed to sit in on court proceedings for the grandchildren who were adopted – has fought to get those kids back, or at least to get visitation. Her pleas have fallen on deaf ears. Back in 2006, DHS asked Brown if she would take her son’s daughter, Envy, into her care along with Envy’s brother, Zyeem, who were both toddlers at the time. The siblings share the same mother but have different fathers. Brown agreed, but a day later DHS learned of the prior neglect reports and removed the kids. However, after reviewing the six old substantiated reports against Brown – which included allegations of a smelly house and no hot water and did not result in the removal of her own children – Family Court Judge Lisa Richette ordered the grandkids to be placed back in Brown’s care. In 2007, DHS approved Brown to take in another grandchild, Kyshone Smith, the son of her now-deceased daughter. Today, Brown’s North Philly apartment is neat and tidy, with the shelves well-stocked and the walls full of religious items and tributes to her dead loved ones. Brown, 50, is a deaconess at her church, Shabach Evangelistic Deliverance Temple, were she attends Bible study every Wednesday. In 2011, she married her boyfriend of six years, Maurice West. Since Brown’s youngest son, 14-year-old Dontay, and her 8-year-old grandson attend Agora Cyber Charter School from home, Brown stays with the boys and has started her own handmade jewelry and glass-engraving business. She loves music, especially Gospel, and she’s a self-proclaimed homebody who doesn’t like to go out unless it’s for church or shopping. Three caseworkers – one for each of the children she was asked to care for – visited Brown’s home once every two weeks for three years and consistently provided positive evaluations in writing. Brown said DHS didn’t mention adoption until the kids had been in her care for more than three years. DHS asked Brown if she would be willing to adopt the children and once she got the approval of their parents, she began the process. That’s when the prior neglect reports were resurrected and all three kids were taken from her care on Dec. 9, 2009. Kyshone’s case was heard by now-retired Judge Flora B. Wolf while Envy and Zyeem’s case was heard by Family Court Administrative Judge Kevin Dougherty. In the first hearing after the children were taken on Dec. 17, 2009, Brown said Dougherty raised several concerns, including an open bench warrant from 1984 that she’d cleared up 10 months prior. His main concern, she said, seemed to be her mental health in light of the tragic deaths she’d just suffered. Dougherty denied Brown standing in the case and barred her from any other court proceedings regarding Envy and Zyeem. Wolf, however, ruled Brown did have standing in Kyshone’s case and allowed her to participate in the hearings. On July 31, 2010, Kyshone was reunited with his grandmother, where he’s remained since without a problem. Wolf and Dougherty declined to comment for this story. After reading of Brown’s struggles in the Daily News in 2010, attorney William Braveman took her case. He filed a petition to intervene on Brown’s behalf. That was denied by Dougherty, but Brown said she was never informed of that. Apparently, neither was Braveman, who kept pursuing the petition, according to emails provided by Brown. Braveman declined to comment for this story. More than four years have passed since Brown has seen Envy or Zyeem. Those aren’t even their names anymore. They were changed by their adoptive mother. But there hasn’t been a day that Brown doesn’t think of those kids and wonder why they were taken. She knows the odds of an adoption reversal are astronomical, but she can’t stop fighting. But even with all her frustration with the system, Brown couldn’t turn her back when, once again, DHS came knocking on her door in December. The agency had three children in a precarious situation and had to investigate their parents. The mother, whom Brown considers like a niece, provided Brown’s name as a placement home. On Dec. 19, DHS called Brown and asked if she’d be willing to take in the siblings – a 6-month-old with a broken leg, a 2-year-old and a 5-year-old. She agreed and the kids were brought to her house that night. 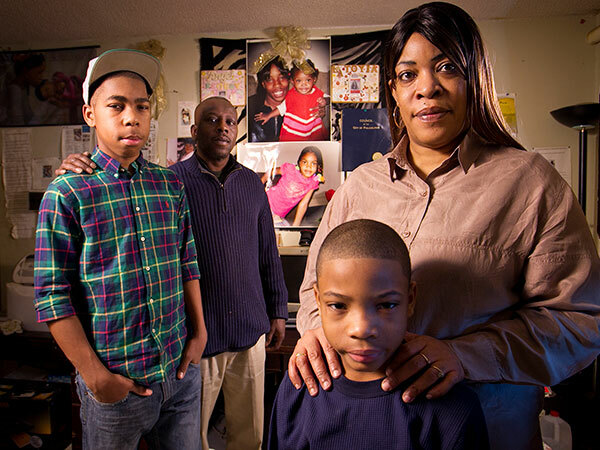 They stayed until Jan. 17, when their mother was cleared of any wrongdoing. Now, Brown just wants DHS and Family Court to help her answer one question: Why? Why were the granddaughter and foster grandson she raised for three years taken from her? But nobody will tell her why it happened or admit a mistake. In an emailed statement to the Daily News, DHS Commissioner Anne Marie Ambrose said she couldn’t speak about any of the cases involving Brown. Among the adjustments Ambrose cited was Improving Outcomes for Children, a delivery model that assigns one worker per family and bases case management on the community where the family lives. But Brown is still left wondering: What has become of the grandchildren she loved and why was she not worthy of being a part of their lives? I am having a similar problem with DHS, since my daughter passed in 2008. I would like to be contacted by her and her lawyer. It’s such a shame so many people issues with DHS are being swept under the rug. I’ve had a family member placed in my custody at the age of 2.DHS has been giving me the runaround all these years he’s now 13 we haven’t received any of the services that he is entitled to, truly is in need of even the principal at his school is fed up to the point she said I need to look into filing a lawsuit against DHS & the judge Whom placed him in my custody. It’s been very stressful. I’ve been trying to find an attorney who will take on this case without having money up front. I know your struggle my prayers are with you stay strong. My wife and i had our 4 grandkids removed because dhs/cua stated that in the 1yr 1/2 they were in our care, NEVER went to any appt (med,den,vision,specialist, etc…) we had got proof that was wrong and even after it was stated the kids were safe, the case worker stood by and said nothing. Even with my lawyer present, we were never heard. Judge Lyris Younge never let my lawyer speak and with a smirk on her face dismissed us out of court. When we reached out to the case worker, she told us to stay away or the cops would be called. We haven’t the resources to hire another lawyer but my heart goes out to all who are traumatized by this agency whose creed is “for the good of the children”. We continue to hope and pray that we all who are affected by such ignorance gets what we pray for and so do they…. Things have to change whether it’s on the manager level or case worker side but i feel that alot of these people who are in charge are way under qualified to make such life changing desicions. God bless you all who suffer due to “paperwork” or incompetents. Hi. Please if you have any ideas. Judge younge just terminated our rights. EVERYONE who has seen our story been involved with other agencies… does not know what to do. !!!!!!! Our five boys were taken. I am working on starting a campaign… let me know if you are interested. We need to get our boys home. Daniel can you please reach out, we’ve been looking for you! I am experiencing the same thing. I have never delt with such incompetent idiots in my life and they hold the fate of these childrens lives. I moved from Florida where i was retired. DHS told to get here and the would help me with an apartment…etc… I could go on and on with what they would do to help me so i could get my two granddaughters. NOTHING BUT LIES…..AND THEY SWEAR THEY DIDNT SAY THAT. LOOKING FOR A LAWYER THAT WILL TAKE THEM ON. I forgot to mention the foster mother put my granddaughter to bed many nights without dinner. Good job DHS. Sorry for the delay in responding to your post. Are you still looking for a lawyer? Are you in Philadelphia? If so, we might be able to suggest a lawyer for you. Please give us a call at 215-848-1120. Fridays are the best day to reach us but we do check messages so also feel free to leave us a message and let us know a good time to call you back. I am currently going through a situation with DHS & this Judge as well. I have physical proof, pics & videos, that my children were taken in retaliation against me all because I called the Commissioner’s Action Response Office aka CARO to report a very bias, nasty & aggressive caseworker who came to my home & told me in front of 2 of my children, “you need to beat your kids but don’t leave marks.” The entire case against me is hearsay, there is no physical proof against me at all. I can also prove with these videos & pics that the DHS caseworker falsified reports & lied in court while under oath. They stole my children & placed them with drug addicts & alcoholics who have criminal records and long histories of mental illnesses. The one caretaker also had a warrant out for his arrest at the time the caseworker claims she ran clearances on him but the warrant was issued many months before this caseworker came into my life & I have the video of the man being arrested in his home & taken out in cuffs just days before court when this same judge violated my parental & constitutional rights. The child law advocate involved also lied in court under oath & changed stories that my 15yr old daughter told her. My children are all older & they were asked if they wanted to testify, 2 of them said yes but because my children’s testimony would ruin DHS’s entire case they held are side bar in the beginning & informed the judge so she immediately removed my children from the courtroom along with the witnesses that were at my trial to testify on my behalf. Now since being out of my home my 15yr old daughter has been attacked by 2 caretakers, placed in a foster home where she was being starved & bullied by the other children in the house & because she won’t stop speaking up & standing up for herself they now put her in Carson Valley group home. My 15yr old is the oldest of my 3 children involved in this case & she refuses to allow these corrupt workers course her into telling lies about me so she has been getting threatened, bullied, neglected & attacked. Again, I have physical evidence & proof that this entire case against me is all lies & if I can get the right person/people to help me I am more than willing to go forward & speak out against everyone involved. I also have many people who are willing to testify on my behalf that will also destroy this entire case. Please help me, ANYONE. We need to put a stop to this corruption & these lies. Judge Lyris Younge is the worst Judge in Philadelphia. She has more appeals that any other Judge in that court house. Judge Lyris Younge is arrogant, inept and has little control over her emotions. Judge Lyris Younge has a history of violating parents rights. I’m a former CUA worker of the past 3 years I’ve helped reunify several children with their families. However I do feel that the system is unjust and some judges use their power to make idiotic rulings. I left the CUA in effort to advocate for families who are struggling in the system. If you are in need of assistance please contact me. I, too have Judge Younge currently on my case and she is evil. However, I will fight back and get my children home, if it takes me the rest of my life. It doesn’t matter how evil this witch is she will get her turn because there is a higher power. What goes around comes back around, good or bad. This woman has literally, destroyed families lives because of her poor decisions. But when her turn comes, she will suffer. I pray that everyone who has been a victim of the system’s kidnapping, find comfort in fighting back for our parental rights. Looks like the judge might finally be removed from the bench… a move that is LONG overdue. I had a DHS worker tell me she will plant something in my file for them to keep my kids. I’m waiting on the day that she gets it all back and more. She was under investigation and moved to another part of the office.